Merry Meet! It is October!..the favorite month of the Year for most Witches, including this one! The wheel of the year has turned, Mabon has passed and October has come, bringing cool crisp days, brilliant foilage of reds, golds, rusts and browns, jackets and sweaters are coming out of the back of the closets, garden centers are loaded with Mums, pumpkins, gourds and corn stalks, the smell of woodsmoke hangs in the air, and the Witch’s heart and soul quickens…for Samhain is coming, the New Year…the thinning of the veil….and there are things to be done for the favorite night of the year! I’m so excited! I love this description…it is so perfect for this time of the year. 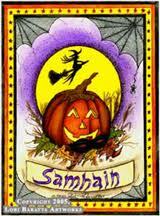 Samhain (pronounced Sow-en) known also as All Hallow’s Eve or Halloween is the third harvest festival of the year. The God has died, returning to the Underworld, to wait to be reborn at Yule. The Goddess is a Crone, mourning for him, leaving the world in darkness for a time. It is a time to honor our departed loved ones and the night when it is believed the veil between the material world and the Spirit world is at its thinnest and that the dead return to commune with the living. In ancient times, Balefires burned on every hillside and great feasts were held. A place was set at the table for family members who had passed on to the Spirit world. For the Celts, tis was New Year’s Eve. In some traditions, Samhain marked a “time out of time,” the ending of the old year, the new year not beginning until the Sun’s rebirth at Yule. Samhain is considered the oldest and most sacred of the Sabbats because it honors the cycle of Life and Death. *Symbolism— Death and transformation, Witches New Year, wisdom of the Crone, end of summer, Honoring our ancestors, thinning of the veil between worlds, death of the year, time outside of time, night of the Wild Hunt, begin new projects, end old projects, Magick, knowledge. 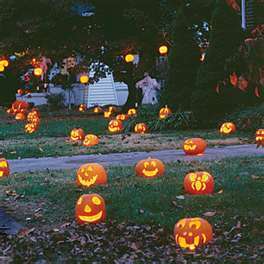 *Symbols/Tools/Decorations— Jack-O-Lanterns, Balefires, Masks, Besom, Cauldron, the Waning Moon, black altar cloth, oak leaves, acorns, straw, black cat, Crescent Moon, grain, bare branches, pictures of ancestors, candles. *Foods— Apple, pumpkin pie, pomegranate, pumpkin, squash, hazelnuts, corn, cranberry muffins, bread, ale, apple cider and herbal tea. *Spellworking/Ritual— Honoring/consulting ancestors, releasing the old, foreseeing the future, power, understanding death and rebirth, entering the underworld, divination, dance of the dead, fire calling, past life recall. How can you celebrate Samhain?..besides of course trick or treating, visiting corn mazes and haunted houses, hayrides and Halloween parties? One custom of this Sabbat that I love is the “Dumb Supper.” This is setting a place for the spirit of your departed loved ones at your table and lighting their way to your hearth with carved pumpkins and candlelight. I have done this for several years now and it’s really a special thing to do. You can set a picture at the place setting or settings of the person you are inviting to join you. Turn off all the lights and just have candles lit at the table. Make it a silent meal..no talking….just focus on your loved one you are remembering, and maybe THEY will have something to say to you! Dress up for the occasion..whether you wear a costume or put on your best witchy clothes, hat, robe… It’s your night…dress for it! Have a bonfire under the Moon. Throw your dried harvested herbs in to make the smoke even more magickal. 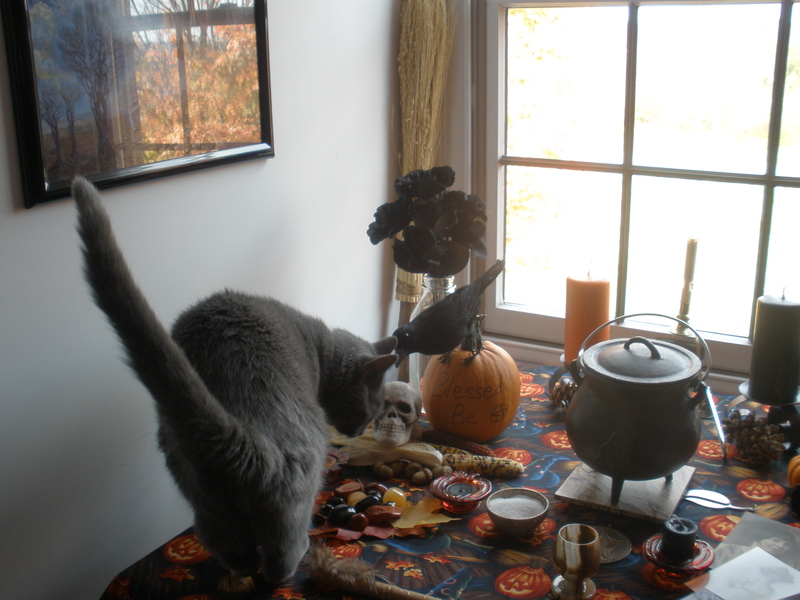 All forms of divination are paramount on Samhain Eve. 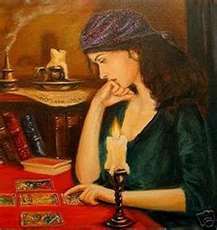 Dark mirrors for scrying, Tarot cards, runes, or pendulums are all perfect tools to take advantage of the heightened spiritual energies at this Sabbat. Set up a table by the fire and do some tarot or rune readings for your friends and family or just see what the Universe has to say to you on this night. If you are blessed to have some time alone, contemplate the coming winter, and use this time out of time to let die old ways of thinking, outworn beliefs, and negative patterns. 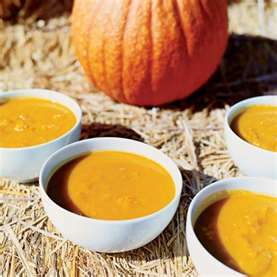 One of my favorite things to do just before Samhain, is to have a Harvest Soup Party. I invite some friends and family over, telling them to be sure to dress warm. 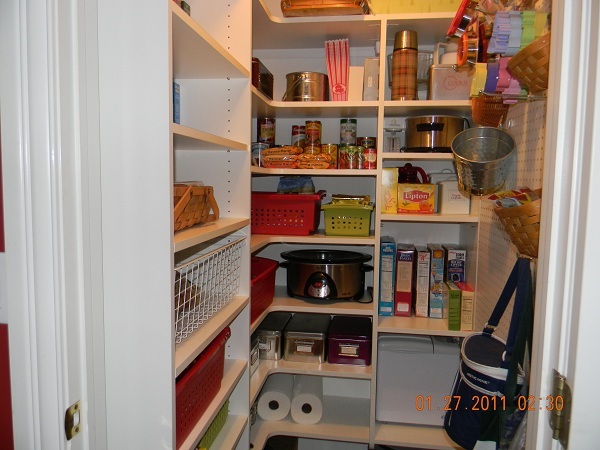 I set up about 3-4 crockpots of different soups…like chili, veggie, potato, and corn chowder. I have bowls of toppings such as crackers, shredded cheese, bacon bits, sunflower seeds, sour cream, croutons. I have a pumpkin tureen filled with warm spiced cider..some vodka or rum can be added for the adults. A couple of desserts such as pumpkin pie and apple crisp round off the menu. A bonfire is going, bales of hay with fleece blankets are great for extra seating, and bandannas in orange, black, brown and red are great to use as napkins! 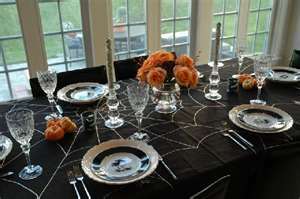 You can have a table set up for pumpkin carving for the kids..with the adults help of course. Tell ghost stories and roast marshmallows to finish up the evening. Everyone loves a great night outdoors with good food and good company….they will look forward to your party every year! I’ve got my Autumn decorating mostly done today…decided I needed to shop for a few new things for the house and the weather will be perfect this week to go pumpkin and mums shopping and apple pickin is on the agenda too. I’ll be making my famous Amish Apple Pies this next week as well. Yummy!! October is a wonderful month and it seems to go so so fast..at least for me it does. LOL! 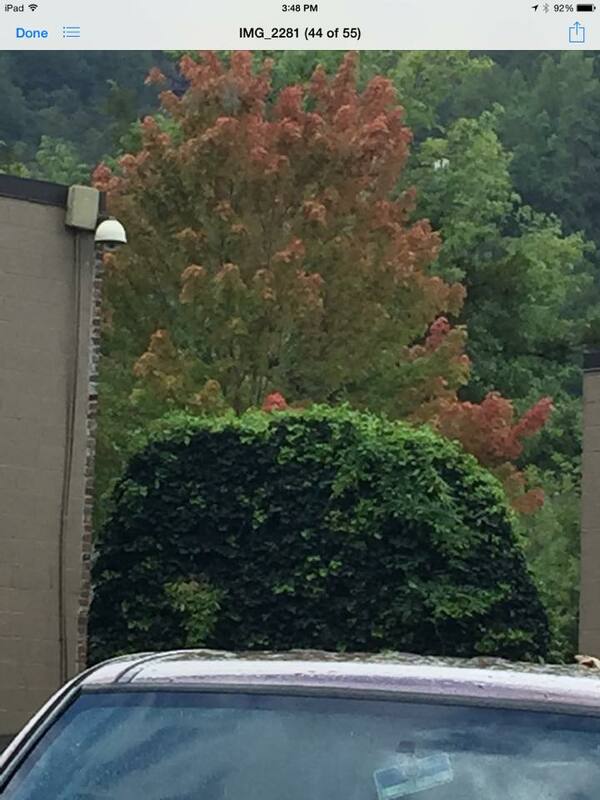 Be sure to enjoy every minute of it…take a walk or a drive and take in the brilliant color. 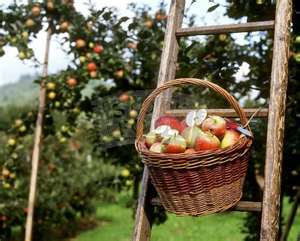 Visit an apple farm and have a caramel apple or sip on some apple cider. I love to bake and cook this time of year. When you do cook or bake, make up some extra and take it to a neighbor or someone you know would love it. Don’t forget the critters! 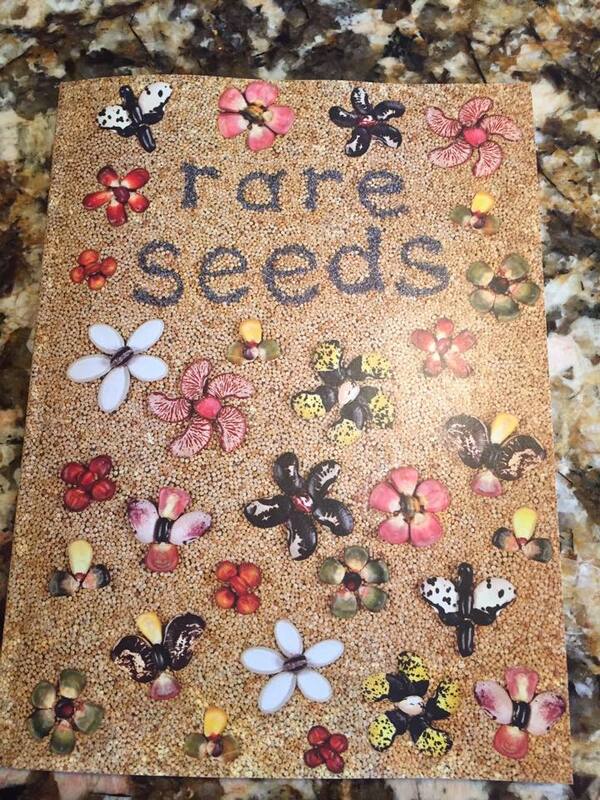 Put out Indian corn, peanuts, and bird seed for those who are gathering for the long winter ahead. Bring in the last of your harvest before the first frost. I have herbs to get in and I need to do it tomorrow as we have frost warnings already! I’ll post blog soon with some of my favorite Autumn recipes. In the meantime, enjoy the cooling weather and the change of the Seasons….Happy October! *Sources..my BOS & Simple Wicca by Michele Morgan. Pictures from the internet. I recently read a newletter from Patti Wigington at About.com that I thought was a great article and I wanted to talk about it here on my blog. She talks about how we come to this path for various reasons and that finding our way of practicing our craft and honoring our Deities should be something we think about and “do” everyday. There are many of us who may only celebrate at Full Moons or on Sabbats or perform a spell occasionally when the mood strikes us. They may have read a book or two or three and think that they know everything they need to know. She calls them “Weekend Wiccans”. A pagan or witch who really grasps the meaning of living the magickal way of life…finds some way to celebrate everyday. 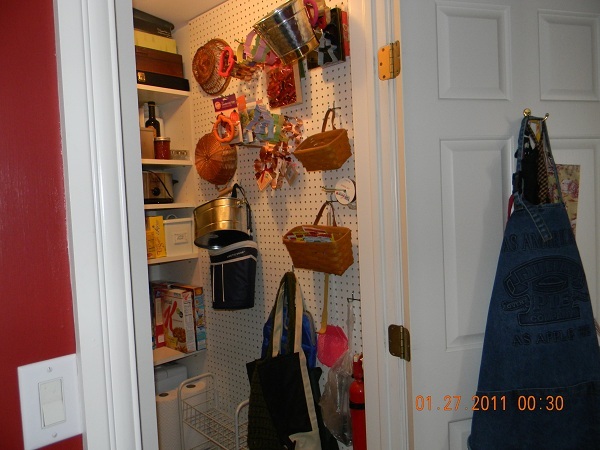 They take notice of the small things throughout their day to day life that brings joy and magick to them. Everything they do is with purpose and intention…to honor their deities and Mother Earth and Her inhabitants, and to increase their own power in manifesting the life they desire for themselves and their families. I am sure that you know someone who does this and does it beautifully. How do they do it? How do they find the time? Well, lets talk about that. This newsletter brings up some suggestions and I have a few of my own. You see I am one of those witches who strives to find magick in my everyday life. Some days I am wonderfully successful, some days I’m mediocre, but I DO try, every day, to make my home and my life magickal. -My very first suggestion is to watch a sunrise or a sunset and moonrise. Watching this wonderful moment in time..everyday…will remind you of the wonder of the turning of the wheel, of the day that is starting or ending. I can’t watch a sunset and then the mystical moon without feeling so blessed in my path and to thank the Goddess for it. -Know the phases of the Moon..pay attention to when the Moon will be full or new, or if She is waxing or waning. Pay attention to how you are feeling during the different phases. Knowing the phases will ensure that any spells or rituals you perform will be as strong as they can be if done during the right phase of the Moon. It connects you to the flow of energy, the changing seasons, etc. The Moon rising and setting is what keeps the wheel of life rolling. -Read everything you can get your hands on..never stop learning! I have been reading witchcraft books for 13 years now and there are many, many I still havent’ read or want to re-read. Everytime I read a book I learn something new..and can apply it to my practice or discard it as not helpful to me. With the internet at our disposal and our witchy facebook friends, we get alot of differing opinions and ideas thrown out as facts. Being knowledgeable about your craft will help you to decide what feels right to you. -Be a caretaker of this Earth we live on. You can do magick everyday by being mindful of your relationship with nature. Recycle, compost, reuse, watch your energy usage. Also you can plant trees, vegetables, herbs and flowers. Collect rainwater. Be close to Mother Earth, dive into her dirt, sit under a tree, feed and water the birds. Be aware of the subtle changes in the seasons. These things alone bring awareness of the magick in our everyday lives. -One of my favorite ways to bring magick into my everyday life is to light a candle with intention. 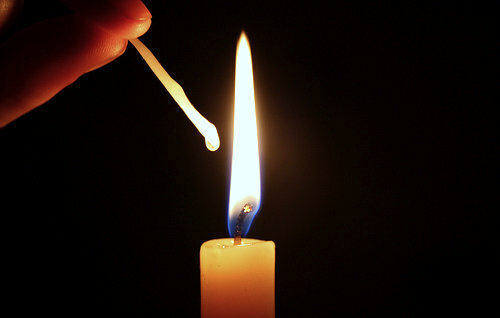 I light a candle everyday with the intention of sending healing to someone I care about. There are so many ways to be witchy. Make loose incense, burn it in your cauldron and smudge your house with it to clean out the negativity. I love grinding herbs and resins with my mortar and pestle and make a sweet or spicy incense. Carry crystals with you for the purpose you are needing that day such as healing or protection or to draw love. Take a few minutes everyday at your altar to meditate or send a prayer to the Goddess/God. Have a cup of tea that you have made yourself from your own herbs grown in your garden. Give an offering to the fae and ask them to aid you in your garden. All of these things just take up minutes of your day or no time at all. -Be empowered. Be aware of the power you have to manifest your desires yourself. Be honorable in word and deed. Use your magick for good and to better your life. Be helpful, loving, respectful to others and yourself. Giving love is what we are all here for after all. Be responsible for you own actions. If you are unhappy or living a life much less then you should be, take the steps to fix it. You deserve your best life! -Find happiness in the small things in life. A gorgeous sunny day, a moonlit starry sky, a good simple meal of fresh foods, a good book, the smell of woodsmoke or lavender growing in your garden. Keep your home harmonious, clean, happy. Live a balanced life. Be aware of small things with big impact and be grateful for them. Focus on the positive and let the negative go. Be happy! -Honor Goddess/God everyday in some way. 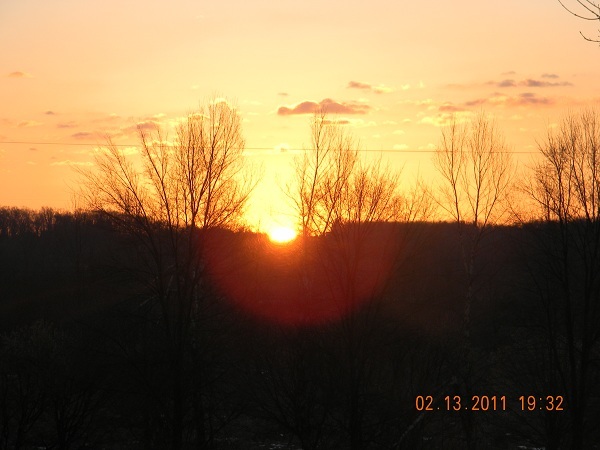 A morning prayer for a good day, an evening thank you for the things you are blessed with. 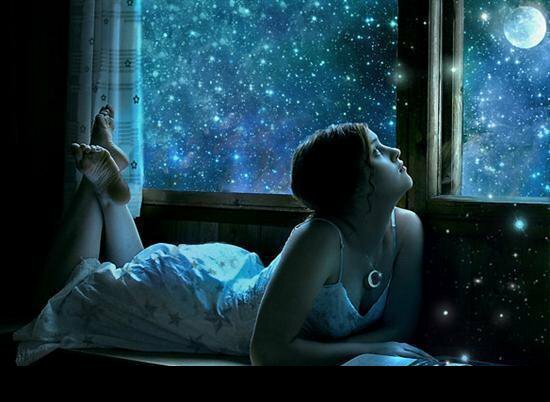 Go out and look at the Moon goddess and draw Her in….feel the energy you can receive from Her! Sit in the Sun and feel the warmth from the Sun god. Be aware that they are within you..not without! You can draw strength from them by looking inward. When you are still…they will talk to you. -Keep a BOS or journal. I have journaled for 15 years and writing down my thoughts and feelings and the things that are going on in the world or just my world is very important to me. It is a record of my life that will be passed down to my children & grandchildren. It helps to free my mind from all the thoughts floating around in there as well. LOL. A BOS is a witches most important tool besides themselves. It is a place to go for information to aid you in your magick, your spells and rituals. 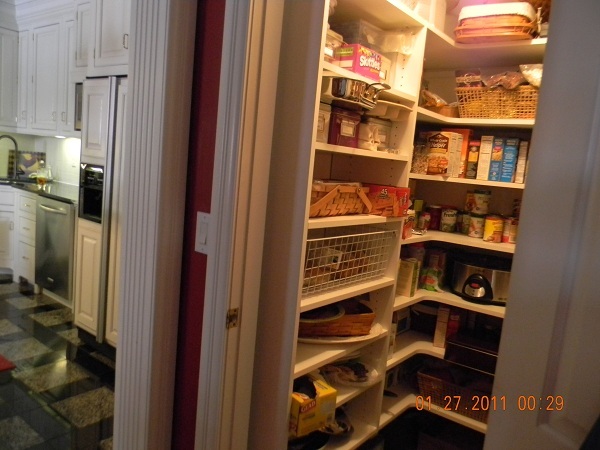 It makes life easier to have that information in one place when you need it. -Bring magick to the mundane part of your life. When you cook, put all your love into it…no matter how simple the meal, your love will make it delicious. When you bathe or shower, use yummy smelling products that remind you of your garden or your favorite spice. Picture all the negativity washing away from you..any bad feelings or anger go right down the drain. Listen to music that soothes your soul or makes you feel positive and happy and energetic. If you are washing your car, place protection all around it to keep you safe. 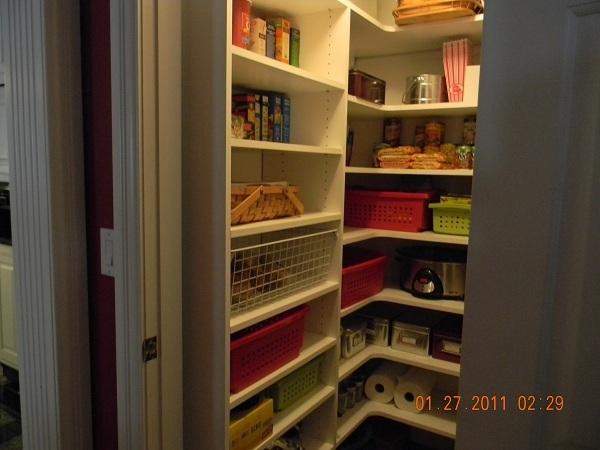 When you clean your house, wash out the stagnant air and bring in fresh air. 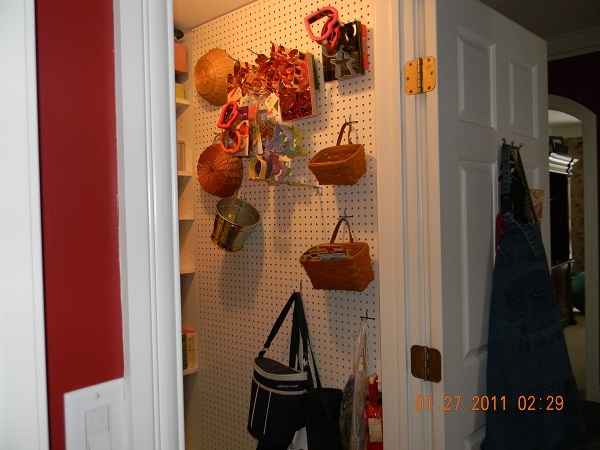 Place protection and love all around your home while dusting it. Picture your home as a place of love and harmony and balance. You are manifesting a better life for yourself when you do this. Now I know that some people will be saying that they do NOT have time to do all of this. After all, you have jobs, kids, furbabies, errands, extended family, appts, etc to take care of. But many of the things I mentioned above, you are already doing. Just change the way you look at what you are doing every day. Don’t look at it as a chore, look at it as a chance to bring magick into your day. Find a way to find the time for your craft everyday. If all you do is spend 10 minutes outside…to connect with nature….then you will find that magick and want it so bad that you will find other ways to get it…I promise you. The more you practice..the better you get at it! Picture in your mind..you ….at your best witchy self and you will achieve it! My life as a witch just keeps getting better and better and I understand more and more that magick and the divine and nature is all around us. There for us to enjoy and take in. I can make of my life what I want it to be. Even when everything seems to be going wrong, I can find the silver lining on a cloudy day. So can you…just look for it…MAGICK! Big improvement! 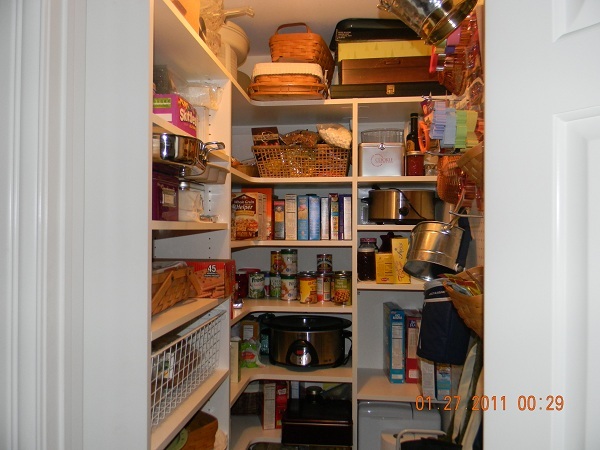 Now this job took me about 2 hours really…but that was because I went thru every can and box etc checking expiration dates..you would be surprised how old stuff creeps to the back of the canned goods LOL. It also took me a little time to decide what I wanted on what shelf…but I’m very happy with the outcome. Good thing the trash pick up is tomorrow as well…4 bags of trash! I also have a dozen or so items to go to Goodwill and a couple of things I’m passing on to others. So….another day of cleaning done and I still have the evening to enjoy reading, crocheting, relaxing…while feeling that I got something BIG accomplished. Now as I had said earlier, I put on my “Witchy” music while I was working. I have an Ipod and I have a playlist that is nothing but music that I feel inspires me, or is actually sung by Pagans/Witches or by artist I think MIGHT be witchy! 😉 Some of these artists are Inkubus Sukkubus (one of my favs), Loreena McKennitt (Another favorite), Enya, Evanescense, Within Temptation, Wendy Rule, Kelliana (who I just discoverd and love) Jenna Greene (Hi Jenna! ), Lisa Thiel, SJ Tucker, Celia, …and some instrumental music. Of course the soundtrack to Practical Magic and some Stevie Nicks as well!! There is Nightwish, Blackmore’s Night. I am always looking for more, so if you love someone I’ve missed..please let me know! There are others on my list I can’t think of right now as well I’m sure. I love the pretty music and I love the music that makes me get up and dance!! The more upbeat the better when I’m cleaning too. So tomorrow, I’m going to tackle something simple as I won’t be home part of the day. Oh yes, I also redecorated our guest bathroom just for fun. My hubby has kind of taken over it, so I “manned” it up a little bit for him 😀 Got rid of the flowered shower curtain..brought in earthier colors…he’s going to be very surprised! 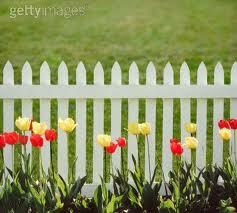 I am planning on picking up a potted bulb flower ..hopefully a daffodil or tulip in yellow. My Imbolc altar is finished other then that..and of course the “cakes and ale” which always comes to the altar the day of. I will post pics and talk a bit about why I chose what I did to place on it. 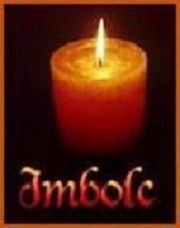 Imbolc, in case you didn’t know yet, is also the New Moon…so the magick will be strong. I wish you all a wonderful evening..Be safe, stay warm. May the Goddess wrap Her arms around you in love and may you feel the comfort She brings. 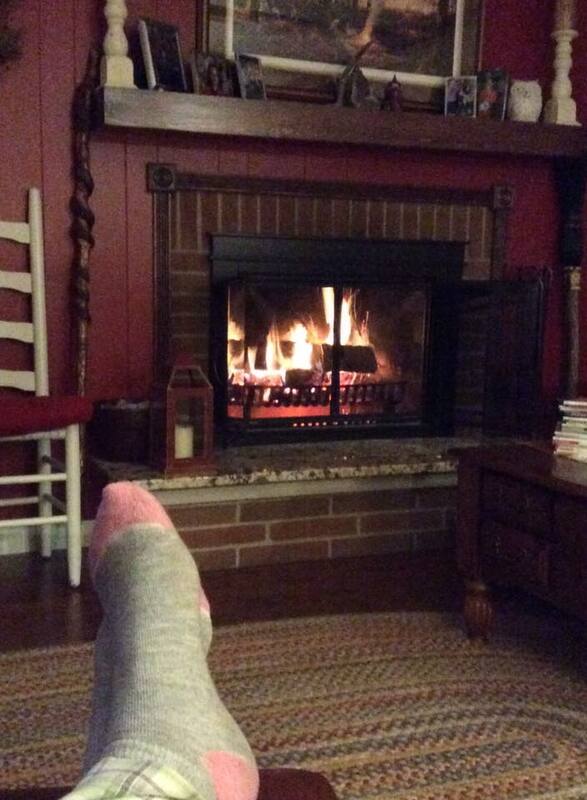 Curl up with a blanket, a fire, a good book..relax! Merry Meet my witchy friends! 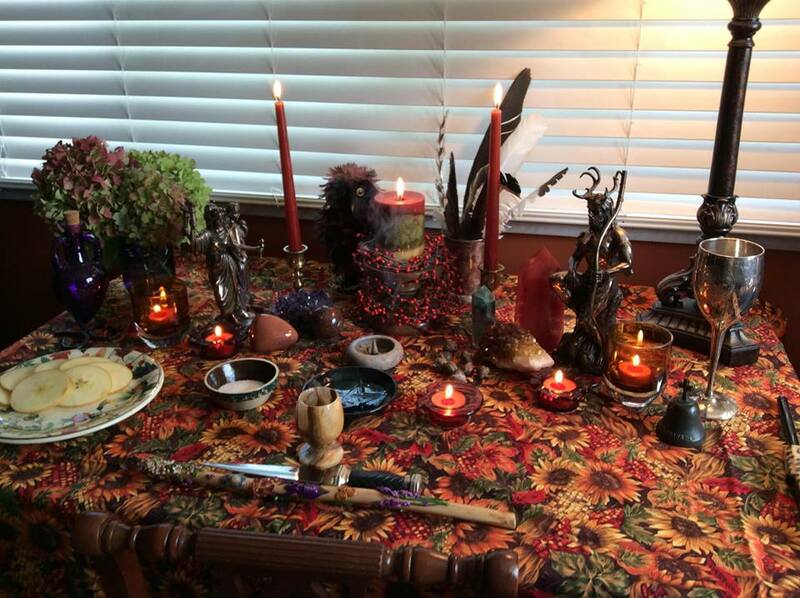 Today I finally got my Samhain Altar ready…my favorite altar I think for my favorite time of year! I had so much fun choosing the fabric for the altar cloth..and I found the perfect one. It is in indigo, black and orange..the colors representative of Samhain…it has Jack O’Lanterns, witches hats and witches brooms…just cheerful and fun. 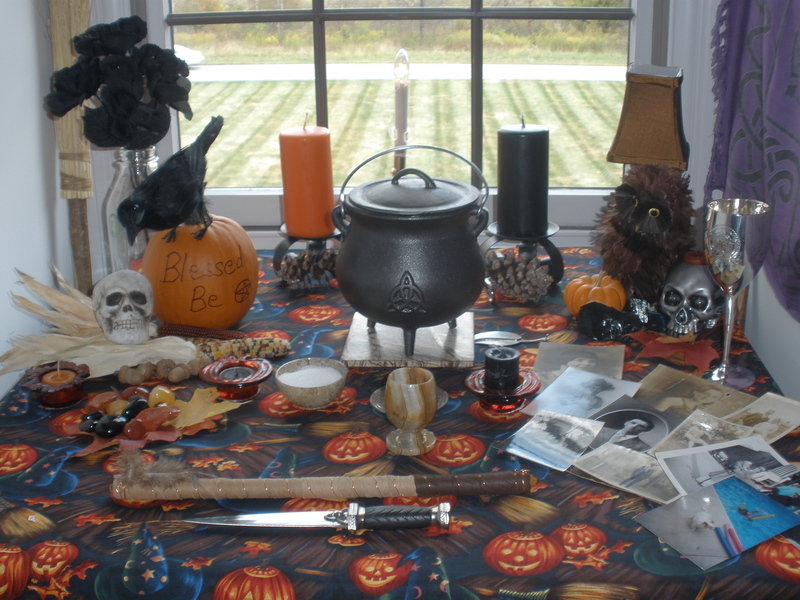 My Samhain altar is about fun and seriousness at the same time. The fun stuff is the owl, the pumpkin and raven, black roses, skulls etc. The serious stuff…the pics of my ancestors who have gone on before and I will be calling on on Samhain night! The witchy stuff..an orange Goddess candle to represent the last harvest festival, and the black God candle, to represent him dieing and waiting to be reborn in the spring. Other harvest reps are the pumpkins, indian corn, acorns and leaves. Crystals are jet, obsidian, black tourmeline, red river carnelian, orange carnelian and orange jasper. There is a large piece of obsidian that could be used for scrying..as diviniation is very powerful at Samhain. I have the reps for the quarters as always, one change is my cauldron is representing Air as I will be burning loose incense rather than a cone or stick. 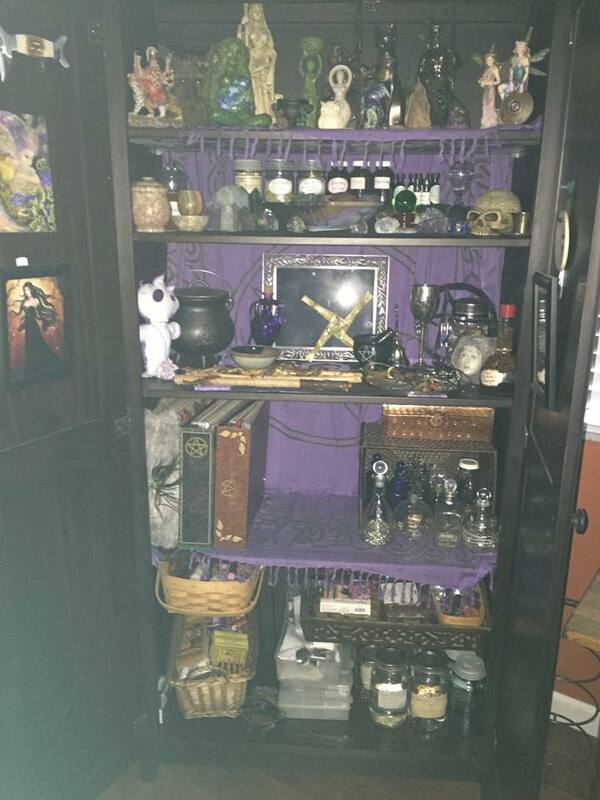 My atheme and wand are always on my altar of course. My ancestors pictures are precious to me…these are mostly pics taken when they were young. My maternal grandfather, both grandmothers, both sets of great grandparents and a great great grandmother. An aunt who died when she was 2 years old..all mean much to me. I call on them often and I can’t wait to visit with them again on Samhain night! There is also pics of my two chihuahuas..Pepper and Charlie…my girls are in the pics too..but thank Goddess they are still with me!! The thinning of the veil is a very magickal mystical night for all witches. Who would you like to hear from that night? I just had to post this pic too..this is my male cat Jasper…1/2 of my familiars…coming to bless and approve my altar. He does this everytime..the minute I’m done setting up…here he comes..he jumps up..sniffs around..bats the crystals around..plays with my wand and then jumps down. He is a very witchy cat and I love him! 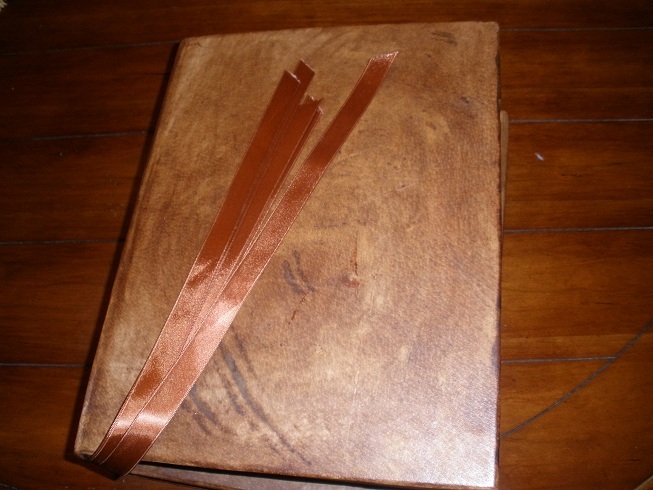 I mentioned that I would be burning a loose incense recipe on Samhain night…my next post will be about that..the recipe and the how to’s….I’ll post in the next day or so. 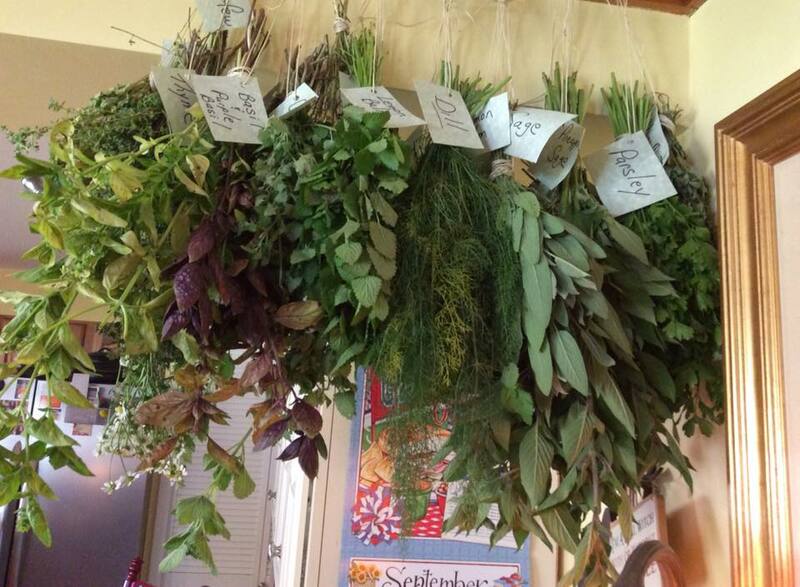 Herbal remedies and sisters in spirit……. Merry Meet again friends…Hope this finds you all well and happy. Here in Ohio we are enjoying a few days of gorgeous Autumn-like weather…its been really cool at night..around 70 during the day…windows are open airing out the house..perfect weather to me! But it is only a glimpse as it is going to warm up again starting tomorrow. 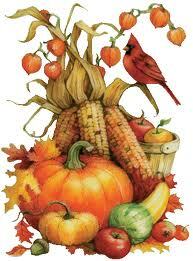 But the nights are staying cool so it is a promising sign that Fall..my favorite time of year..is almost here! I just come alive in the Fall..I love the crispness of the air and crunching leaves and the beautiful colorful trees. 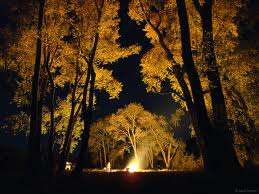 I love the smell of woodsmoke, good food cooking in the slow cooker, apples, pumpkins, mums, the harvest moon..just magick! While pot roast was cooking in the crockpot today I decided to either make or finish up some herbal remedies I had been wanting to make. 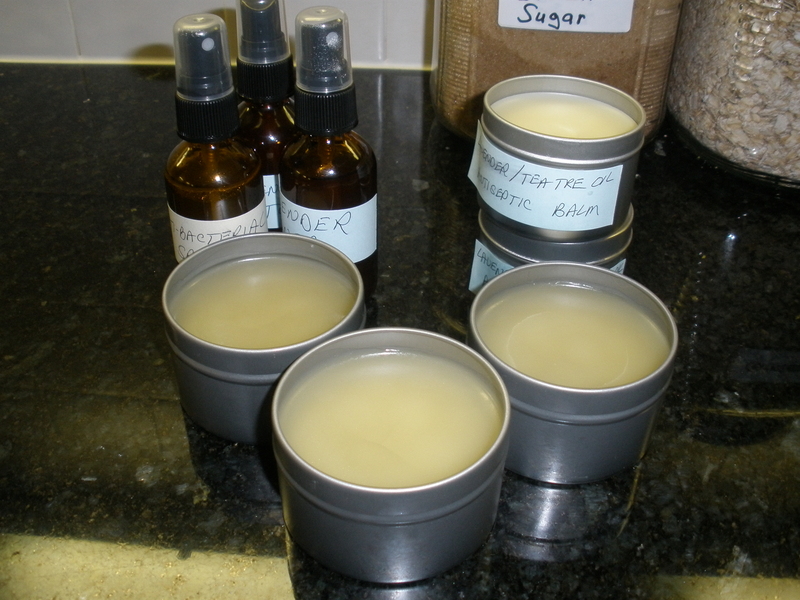 I had brewed olive oil with calendula for several days and wanted to make it into a salve. This works like a do’all skin ointment. Put it on cuts, bruises, reddened or dry skin, callouses, hives, rashes, bug bites, mild burns…just about anything. I also made a lavender toner a couple of weeks ago. I just needed to strain off the lavender buds and bottle it. 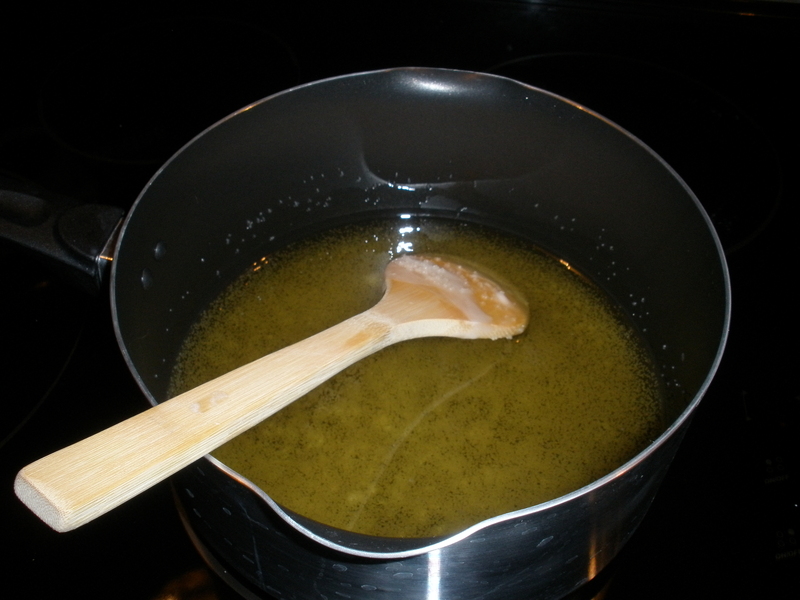 I also made a germ fighting spray that was posted online by Granny’s Hearth. I feel so “witchy” when I’m making them and putting a spell on them! 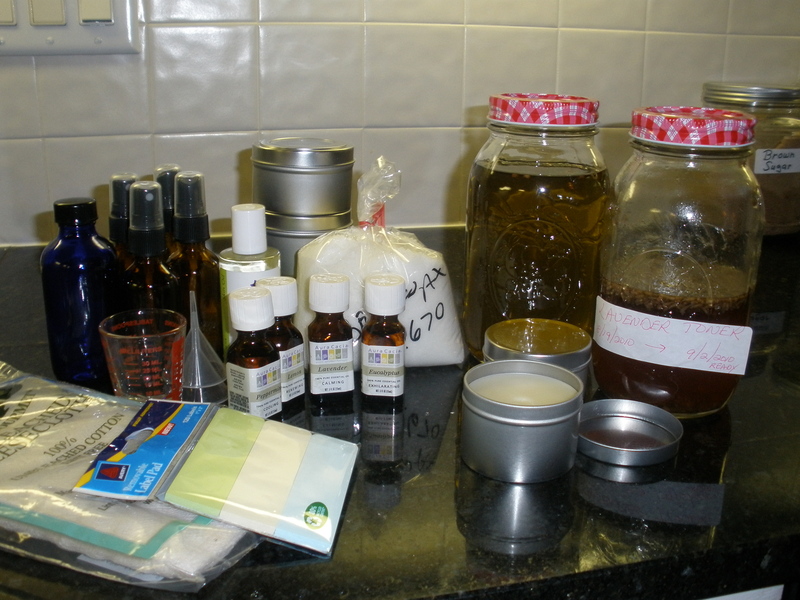 I have really just started making homemade herbal remedies for medicinal purposes. 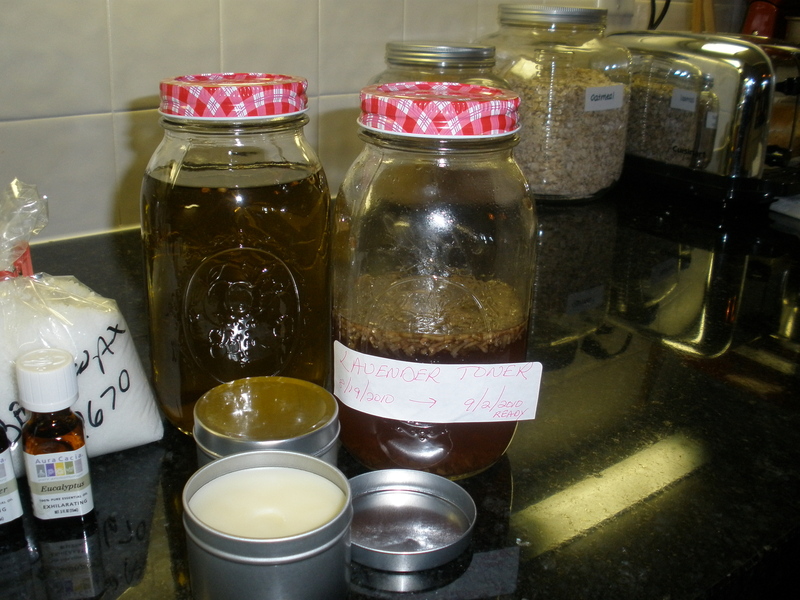 I have made homemade cleaning supplies, homemade soaps, essential oil sprays for home or perfume, but had never really made homemade salves etc. I have enjoyed it immensely and find that they work fabulously..even better then the over the counter stuff you buy at Walmart and Krogers. To increase my knowledge, I am going to take an online herbal course thru Susun Weed who came highly recommended by several of my facebook friends. I can’t wait to really get some help on the subject and to become more learned in it. I have bought many books and find it pretty simple to follow but I want to learn from an expert! 🙂 I have a lovely sister in spirit who will be taking the class with me…it’ll be great to compare notes and discuss the classes together. Speaking of facebook, I just have to say that I have got the best facebook friends ever. So many wonderful, kind, funny, caring people. I have a habit of asking a question of the day..and everyday I get people who come and share themselves with me…if there is disagreement it is done kindly and respectfully…there has yet to be any rudeness on my page which I’m grateful for..as I have seen it and don’ t like it. I believe in live and let live and telling someone their beliefs are wrong goes against my grain. I am so grateful for all of my fb friends because they have made my world bigger and lovelier, they have expanded my knowledge, and I feel a true spirit connection with people all over the world. Thank you so much to each of you!! I also am part of a wonderful online “coven” for want of a better word…my sisters in spirit…my closest fb friends…and they are pure joy to me…They open their hearts everyday to each other…whoever needs comforting, support, someone to listen, candles lit, prayers sent up, questions about anything..we are all there for each other! We share our lives quite openly..we are true sisters in every sense of the word. I am incredibly blessed to have them and I love each and every one of them…Thank you from the bottom of my heart my sisters! The New Moon is coming soon..for me, this New Moon means a good cleansing and blessing of my home…renewing the protection I have set around my house, starting my “Fall cleaning”..getting the house ready for the cool weather..such as getting the fireplace cleaned and wood ordered, stocking up on baking supplies, and having a list of indoor projects to keep me busy in the lazy months! May you all have a blessed Labor Day tomorrow and I believe today was Father’s Day in the Southern Hemisphere! Remember to be kind, live in each moment, spend time each day reflecting on gratitude for what you have been blessed with in your life, and send out love to those around you and you’ll get it back.